An updated version of the life history of the Malay Viscount can be found by clicking this link. Caterpillar Host Plant : Palaquium obovatum (Sapotaceae). 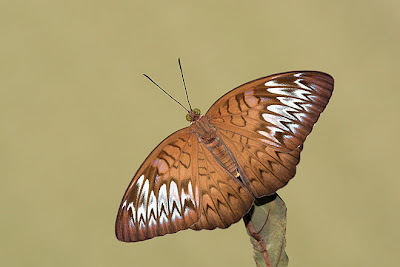 Physical Description of Adult Butterfly : The upperside of the Malay Viscount is a pale greyish ochreous brown, with sub-marginal V-shaped markings on white background. The V-shaped markings are conjoined. The underside is paler, with a faint tinge of violet in a sidelight. In the male, the underside of the hindwing has two rows of small black submarginal separated V-shaped markings whilst these are less distinct, and joined in the female. 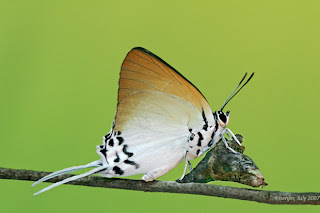 Field Observations of Butterfly Behaviour : The Malay Viscount is a forest denizen which is rarely seen outside the nature reserves and forested areas of Singapore. It is relatively common and both sexes are often seen puddling on rotting fruit, carrion or at damp seepages. It flies in the typical Tanaecia or Euthalia fashion, gliding powerfully as it flaps its wings. It is a skittish butterfly, and when disturbed, takes off in a very capable fashion. Mating pair of Malay Viscount - left-male ; right-female. Note the differences in the underside markings between the two sexes. 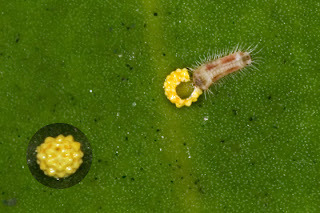 Early Stages : The female oviposits on the underside of a mature leaf (usually at the centre) of the host plant. 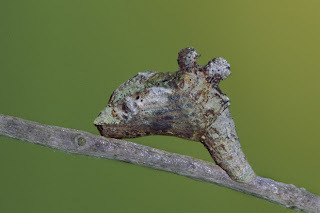 This is quite unlike its close relative, the Horsfield's Baron (Tanaecia iapis puseda), where the female searches for a leaf, and reverses till her abdomen touches the tip of the hostplant leaf, and oviposits on the tip of the leaf. 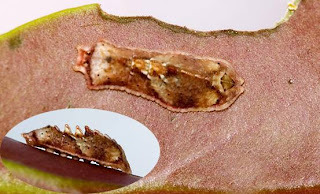 In the Malay Viscount, the female touches the veins of the leaf of the host plant, and oviposits a single egg on the underside of the selected leaf. Two views of the Malay Viscount egg. 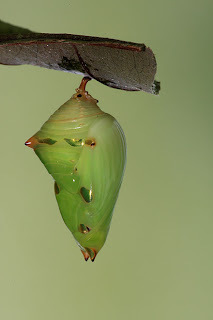 After about four days, the 1st instar caterpillar hatches from the egg, and makes its first meal of the eggshell. 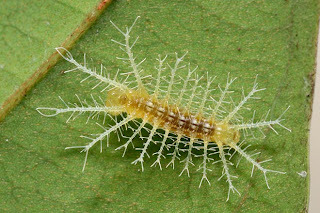 The caterpillar crawls towards a younger leaf and proceeds to munch on the leaf edge. 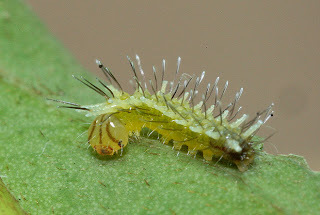 The 1st instar caterpillar is yellow-green with simple white-tipped black spines from its body. 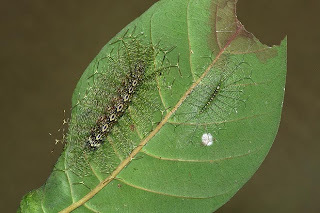 After eating for about 2 days, the caterpillar moults and changes into its 2nd instar. 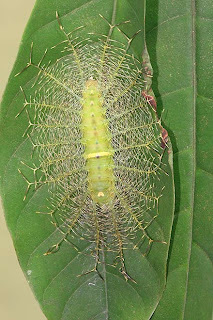 The caterpillar now sports branched spines which radiate horizontally and flat, away from its body. The spines are a pale cream. 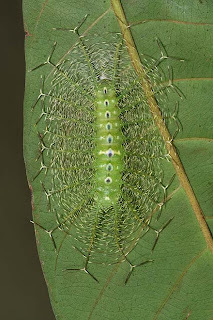 The caterpillar eats very little, making small cuts along the host plant's leaf edge. 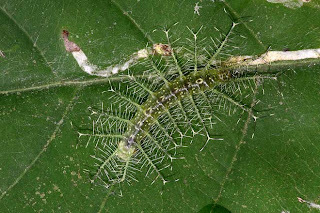 At the 3rd instar, the caterpillar's branched spines are now green, with black/white fine hairs giving it the characteristic "Christmas Tree" appearance of many species of this genus and its related genera of Euthalia and Lexias. 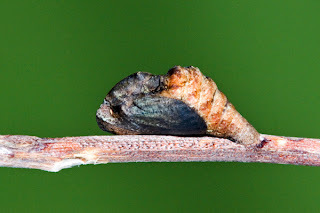 The caterpillar now has a series of oval greyish purple-centred spots along its back. 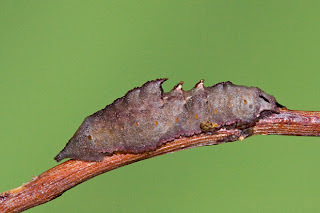 The 4th instar caterpillar appears quite similar to the 3rd instar, except that it is now much bigger, and the oval purple-centred spots are more distinctly marked and fringed with white with a thin black border. The branched spines are also longer and end with a curved T-shaped hooked spines. 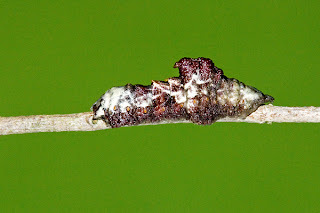 The 5th instar caterpillar has additional whitish spots along its body, whilst the white-fringed purple spots along its back are still prominently displayed. The branched spines are also more complex, and gives the caterpillar an appearance of being a lot larger than it really is. It moves slowly, but eats voraciously - finishing almost a single large leaf in about two days. 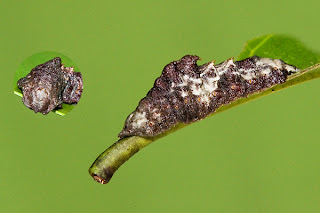 A 5th instar caterpillar next to a 3rd instar caterpillar of the Malay Viscount. Note the relative size between the two caterpillars. 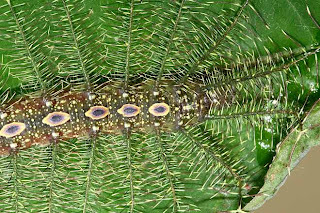 Detail of a 5th instar caterpillar, showing its complex branched spines and the row of whitish fringed purple spots along its back. 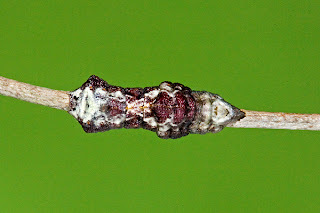 After about 17 days, the 5th instar caterpillar shrinks in length, and the large purple spots along its back become less distinct. A white saddle stripe appears. Later in the day, the caterpillar turns a yellowish green and stays in this pose until pupation occurs. 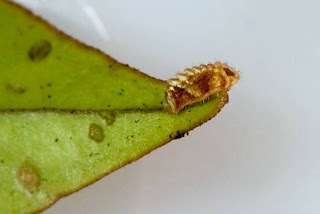 Pupationg may occur on the top or under surface of a leaf of the host plant. The pre-pupating caterpillar anchors itself securely via its cremaster. The pupa hangs vertially from its cremaster without the need for a girdle or any other support. 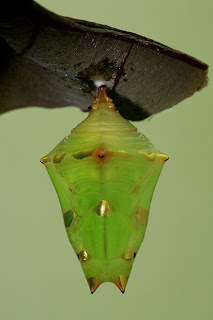 The light green pupa sports a series of gold-coloured spots which are highly reflective. 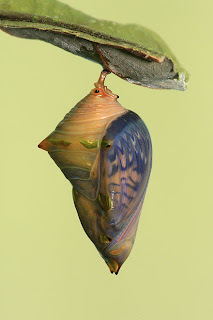 After about nine days, the pupa turns dark, and the pupa shell becomes transparent the night before eclosion. 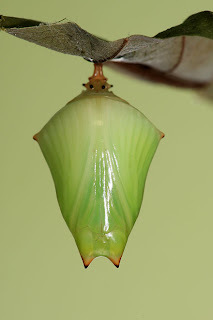 The wing patterns of the butterfly can be seen clearly through the transparent pupa shell. The Malay Viscount ecloses relatively early in the morning between the hours of 8am and 10am when the sun is warm enough. Not of the feline variety, but butterflies (what else?!). Singapore is home to five species of butterflies from the sub-family Danainae which have been given the common name "TIGER". The origin of the common name probably referred to the striped wing patterns and, in a number of species, the orange colour of the wings. 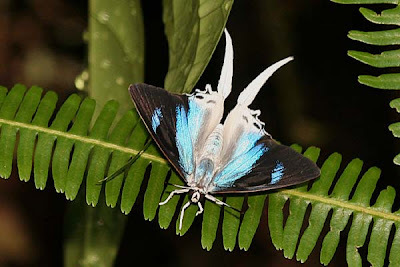 The sub-family Danainae features medium sized to large butterflies which are showy, and tend to fly slowly and gracefully. 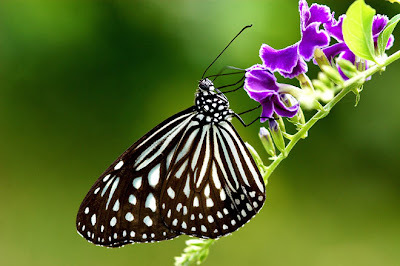 As they fly from flower to flower in search of nectar, one can appreciate their beauty and colours at close range. There is an explanation for their nonchalance and devil-may-care behaviour, due to the fact that almost all the species in the sub-family have "built-in" immunity to predators. 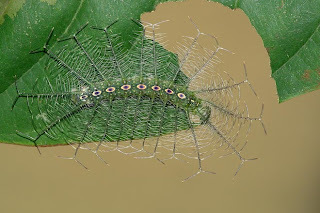 In their early stages as leaf-munching caterpillars, the species of this sub-family feed on lactiferous vines and plants which makes the caterpillars and later on, the adult butterflies, distasteful to birds and other predators. The very obvious markings and colours of the Danainae species is a purposeful 'advertisement' to predators that they are unpleasant to eat, and to stay away from them. 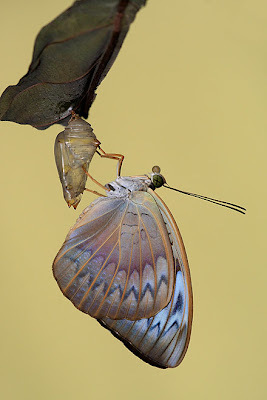 So successful is this display, that several other species of butterflies, which do not have this protection, mimics the colours and patterns of the Danainae to benefit from their immunity to predators. 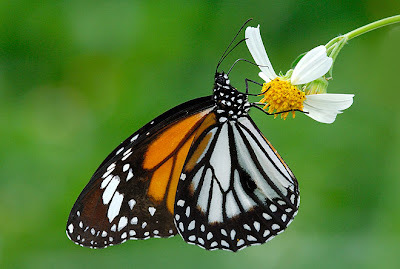 The Plain Tiger is probably the commonest Danaus species and is found in parks and gardens where its preferred host plant, Calotropis gigantea is cultivated. The Plain Tiger has orange forewings with a broad black apical border bearing a series of white spots. It occurs in two forms where form-chrysippus has its hindwing coloured orange as in the forewings. This form occurs more often in northern Malaysia (Penang, Kedah and Langkawi Islands) and in Singapore. 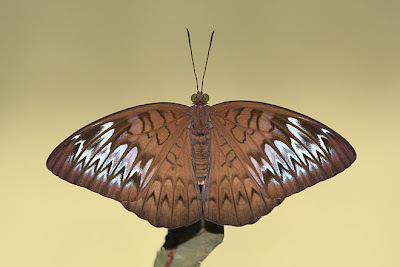 The white hindwinged form-alcippoides is more common in the rest of Malaysia, but also occurs commonly in Singapore. 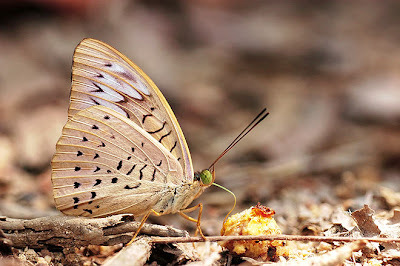 Generally, this form is the more predominant form of the species in Singapore, outnumbering the orange-hindwinged form-chrysippus by at least 10:1 during a survey of the species in 2004. Where the host plant is found, one can often find the droppings of of the caterpillars on the large leaves of Calotropis gigantea. It is not unusual to find a large number of the caterpillars on a single plant where the entire plant may defoliated in matter of weeks. 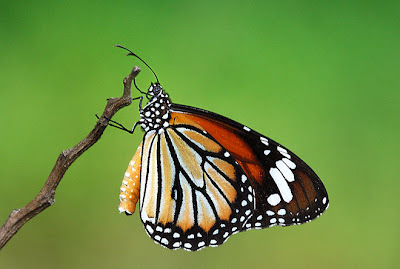 The Common Tiger has the same colouring as the Plain Tiger, except that its wings' veins are strongly marked with black. Sometimes almost as common as the Plain Tiger, the Common Tiger is often found in mangrove areas where its host plant, a lactiferous vine, Raphistemma sp. grows. As in the case of the Plain Tiger, the Common Tiger occurs in two forms. - the orange hindwinged form-genutia and the white hindwing with orange-tinged border form-intermedius. In Singapore, both forms occur, but again, like the Plain Tiger, the white with orange-tinged border form is the commoner of the two. 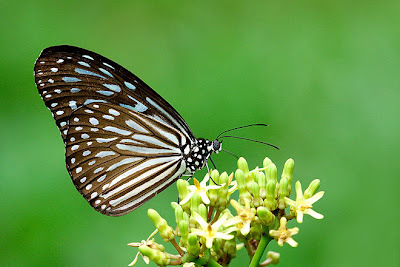 The Black Veined Tiger is the least common of the three Danaus species in Singapore. This species is very similar to the Common Tiger and is often mis-identified as such. However, the difference is that the white hindwings do not have an orange tinge as in the form-intermedius of the Common Tiger. The black hindwing border is also much wider than in the Common Tiger. On the offshore island of Pulau Tekong, the Black Veined Tiger is the predominant species and is much more common than the Common Tiger, as compared to the main island of Singapore. The males of all three Danaus species possess an oval brand enclosing scent scales on the hindwing which appears as a black bordered pouch. The females do not have this feature. The Blue Glassy Tiger belongs to the genus Ideopsis. It is the only representative of the genus in Singapore. 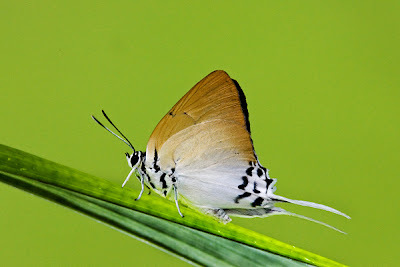 The wings are predominantly a translucent bluish grey, with the veins blackened, giving the butterfly a striped appearance. The Blue Glassy Tiger is common in Singapore, and can be found in gardens, parks and within the nature reserves. Its lactiferous host plant, Tylophora sp. is a common vine growing in secondary vegetation and particularly in the mangrove areas. The species is likely to have several other alternative host plants. The Dark Glassy Tiger which, at a glance, appears like the Blue Glassy Tiger, is the only representative of the genus Parantica in Singapore. 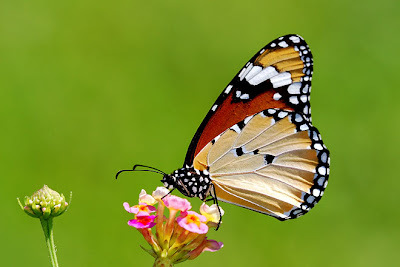 Its closely related cousin, the Yellow Glassy Tiger (Parantica aspasia aspasia) has not been seen in Singapore for a long time, and feared extinct. The ground colour of the Dark Glassy Tiger appears less bluish in flight, giving a more greyish appearance. It can be distinguished from its lookalike, in that the forewing cell streaks of the Dark Glassy Tiger contain thin longitudinal black lines, whereas there is a diagonal black bar in the Blue Glassy Tiger's forewing cell. Both the Blue and Dark Glassy Tigers often occur together in the same vicinity and both are common butterflies in Singapore. The males can be separated from the females by the darkened brands at the sub-tornal area of the hindwing. All the five Tigers are slow flyers and often stop to feed at flowering plants. They are relatively easy subjects to photograph, and are very likely to feature in any enthusiastic butterfly photographer's portfolio of butterfly pictures. All the species are attracted to the flowers of the Indian Heliotrope (Heliotropium indicum) and in particular, the semi-dried leaves and stalks of this plant are particularly attractive to the Tigers.